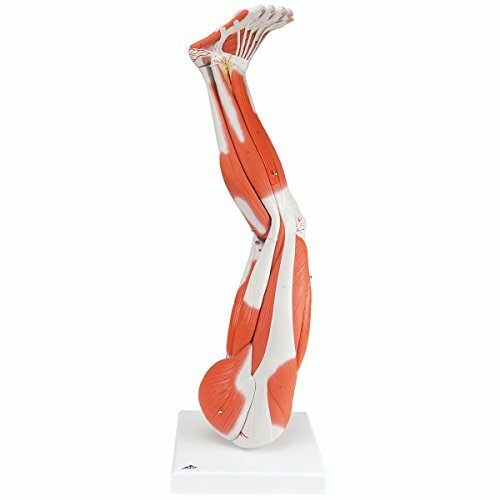 The 3B Scientific M20 three quarters life-size human leg muscle model is used for anatomical study of the deep and superficial musculature, and dissembles into nine parts, including eight removable muscles, for effective demonstration. The model’s leg and foot depict the tendons, vessels, nerves, and bones for detailed examination. The M20 has numbered parts for accurate identification, and is mounted on a removable stand for display. The model measures 10.2 x 10.2 x 30.3 inches/26.0 x 26.0 x 77.0cm (L x W x H). (L is the horizontal distance from left to right; W is the horizontal distance from front to back; H is the vertical distance from the lowest to highest point.) Anatomical models are typically used as educational aids in medical and scientific classrooms and office settings. 3B Scientific manufactures anatomical models, simulators, charts, and other training materials for use in scientific, medical, and patient education. Founded in 1948 and headquartered in Hamburg, Germany, 3B Scientific meets ISO 9001: 2008 standards. If you have any questions about this product by 3B Scientific, contact us by completing and submitting the form below. If you are looking for a specif part number, please include it with your message. 3B Scientific H20/4 6 Part Female Pelvis Model with Ligaments, Vessels, Nerves, Pelvic Floor, Organs, 7.5" x 10.6" x 7.5"